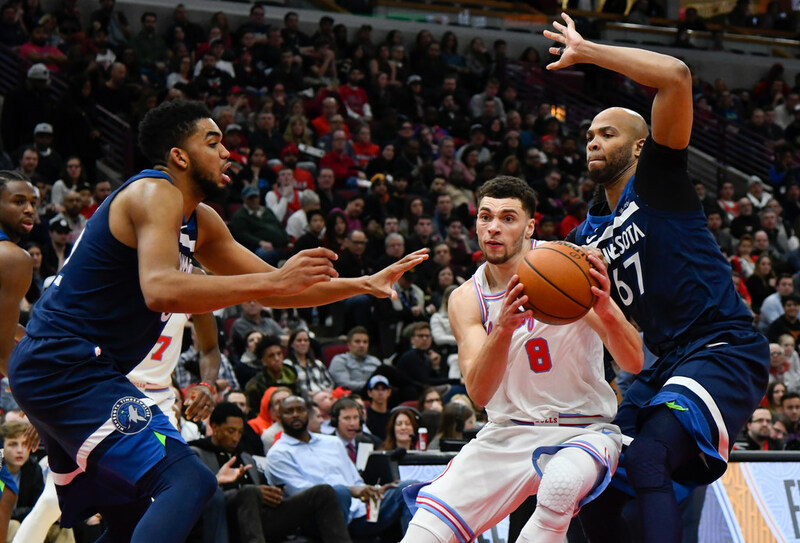 Zach LaVine is an emerging NBA talent, so it would have been fun to have him remain on the Wolves. But would you rather have him or Jimmy Butler? *Aside from the opportunity to acquire a genuine star player in the prime of his career — which is reason enough — the Wolves dealt for Jimmy Butler last summer because there was a lingering fear that signing three extremely young players to huge contract extensions would be a bad idea. The Wolves were in that position because of good drafting and trades from the late Flip Saunders. He turned Kevin Love into No. 1 overall pick Andrew Wiggins in 2014 and drafted Zach LaVine No. 13 overall that year. (Whatever shortcomings both players have, both of those were strong moves). Flip then nabbed Karl-Anthony Towns at No. 1 overall in 2015. Wiggins already signed a max extension last offseason. Towns is due for one this season. LaVine, the third wheel in that young Big Three, was always the wild card in all that but also emerged as enough of a dynamic scorer in years 2 and 3 before his knee injury that he figured to command a big contract as well. Just how big became official over the weekend when the Bulls matched a four-year, $78 million offer sheet from the Kings after LaVine reached restricted free agency. Assuming Towns signs an extension this offseason that kicks in next year and averages somewhere around $30-35 million per season (yes, you read that right), and Wiggins is already making close to an average of $30 million per season, adding LaVine to that mix at close to $20 million would be pricey. The Wolves will face the same conundrum with Butler, but Jimmy is far more accomplished that LaVine on both ends of the floor. LaVine was a good dude and an emerging talent, so it would have been fun to have him around. But in pure basketball terms, I’d rather have Butler on whatever contract he gets than LaVine on his new deal. If Butler walks? I might rather have the cap space than LaVine’s contract. *Damian Lillard sounds kinda sort of happy to still be in Portland. If he ever tried to force a trade to, say, Minnesota … that would be cool. *Former NBA player Tyler Honeycutt died this weekend of a reported self-inflicted gunshot wound after a shootout with police. Honeycutt starred at UCLA and played 24 games with the Kings earlier this decade. He was only 27 years old. Former Minnesota prep standout Royce White, who was drafted in the first round of the 2012 NBA draft by the Rockets and has since become a determined and necessary mental health advocate, tweeted about the response on Monday.